With a 32-point lead coming into Petit Le Mans, all Christina Nielsen needed to do was meet her minimum drive time at the Petit season ender today to become the first woman to win a major present-day North American endurance championship. All we have to say is: it’s about time, and it couldn’t happen to a better person. Nielsen barely missed the milestone last year, missing the GTD-class title in the then-named IMSA Tudor United Sports Car Championship by only two points during the Petit Le Mans season ender. It was her first full-time season in IMSA’s top-level endurance series, and she still finished second in the championship. Nielsen spoke with Jalopnik at Circuit of the Americas about her experiences in racing, and what it’s like to be one of the few women to have competed in the IMSA WeatherTech Sports Car Championship. Nielsen got her start racing in America after former teammates Sean Edwards and Kuba Giermaziak mentioned that their teams in America needed a good Silver-ranked driver. “It’s actually Road Atlanta that I drove on when I first came to America,” Nielsen said, referring to the track that hosts Petit Le Mans. “I thought it was so overwhelming with the elevation [changes] and how fast it was, and I was like, wow—is that how they do it over here? Nielsen competed in IMSA’s four long-distance races in 2014, then came back last year for her first full season in the series. Nobody expected her TRG-AMR team to be a championship contender last year, but there they were—leading with six points going into the last race of the season. For 2016, Nielsen switched to the Scuderia Corsa team, who’s been driving the brand new Ferrari 488 GT3. This year, her lead going into the season finale was a bit more comfortable. Of course, Nielsen winning—and going on to win the GTD championship—is a huge deal. In the entire post-merger existence of IMSA’s WeatherTech Sports Car Championship—which features multiple drivers per team—a woman has never won a championship, despite the fact that women make up just under half of the world’s population. It’s one thing to tell women that they’re welcome at the track and able to compete alongside men, but seeing a woman win a championship goes much farther in proving it. “I feel like there’s a good respect among the drivers [in IMSA],” she said. “And that also includes being a female driver. “I’ve joined a lot of new championships,” she said. “I feel like...if [you’re with] the boys, and this is level zero, they always [go], ‘can she really?’ So, you need to push yourself a little bit further. You need to prove yourself a little bit more. Nielsen has certainly proved herself, even this weekend. 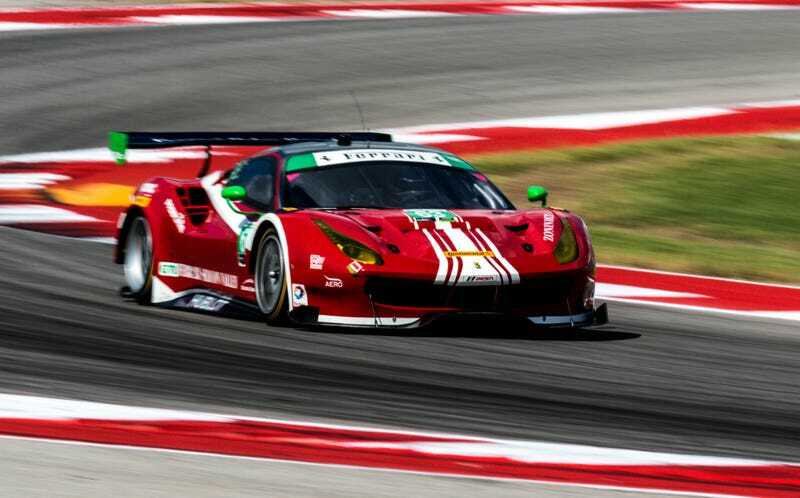 Her quick lap—not a lap by one of the pro-ranked drivers—gave the car a fourth-place start out of the 12-car GTD class, beating several longtime pros, including Sellers. She just hopped out of the car at Petit Le Mans, having competed her three-hour minimum drive time right at the start of the race to ensure she’ll grab the title. The last woman to win an North American endurance championship was Melanie Snow, who won the GTC class of the American Le Mans Series in 2009. This isn’t be Nielsen’s first ground-breaking achievement this year, either. She also became the first Danish woman to have compete in and finish the 24 Hours of Le Mans in Formula Racing’s Ferrari 458 Italia.